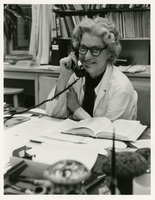 Elizabeth D. Hay (1927-2007), B.A., 1948, Smith College, Northampton, Massachusetts; M.D., 1952, Johns Hopkins Medical School, Baltimore, Maryland, was chair of the Department of Anatomy (later the Department of Cell Biology) at Harvard Medical School, Boston, Massachusetts, and the first woman to be made a full professor in a preclinical department at Harvard Medical School. 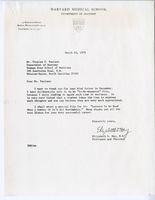 The Elizabeth D. Hay papers are the product of Hay's work as a cell biologist and related professional activities, including attendance at conferences, manuscript preparation, laboratory research, teaching, and collaboration with other researchers. 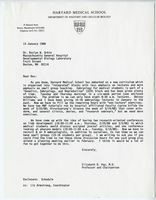 The papers reflect Hay's involvement in the field of cell biology and embryology as a research scientist, including her work as a faculty member at Harvard Medical School and her activities as a member of various professional organizations, such as the American Association of Anatomists, the National Academy of Sciences, the Society for Developmental Biology, and the American Society for Cell Biology. 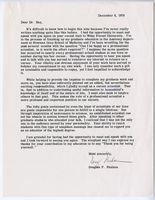 Hay was a frequent speaker at conferences and lectured as a guest faculty member at other educational institutions; her papers reflect invitations to speak at national and international conferences and medical schools. 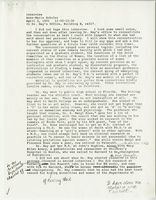 Hay kept extensive reference files of reprints, both her own and those authored by others in her field of interest. 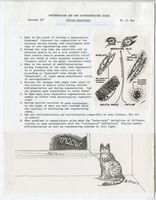 The papers also include a small amount of personal material reflecting Hay's fondness for cats and interest in mycology. 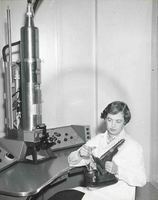 Dr. Elizabeth Hay, seated at the electron microscope, examines the first classroom microscope in America, devised by Oliver W. Holmes for demonstrations in histology in 1847. 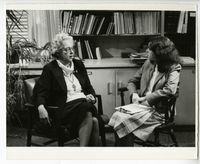 Dr. Elizabeth Hay, Assistant Professor of Anatomy, seated at the electron microscope, examines the first classroom microscope in America, devised by Oliver W. Holmes for demonstrations in histology in 1847.